Flair No. 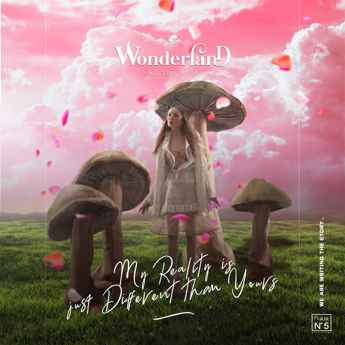 5, is teaming up with nightlife extraordinaire The Rize Group with the launch of Wonderland – a new Monday night concept set to bring a whole new life to The Ritz-Carlton, DIFC’s outdoor party scene, with a kick off-event happening on October 22nd. Calling all unicorn ravers of the land, the weekly event is bringing the 360-nightlife experience with an impressive DJ lineup, new offerings off the revamped food menu, and signature botanical mixes from a wide selection of gins paired with aromatic herbs and blossoms. The venue’s lush greeneries and outdoor sceneries is a playground for guests to dance, dine, and be seen. Music courtesy of DJ’s Chris Wright and Timothy Knight will light up dancefloor and fill your ears with good vibes all night long. The night will come alive as Flair No. 5’ skilled bar team concocts delicious cocktail mixes like the peppered strawberry infusedTangy Bite, berry rich Straight from the Garden, and coffee boosted Wake Me up. Best paired with some tasty bites, the orchestra of flavors will surprise your palettes as the brilliant kitchen team whips our fresh servings of Prawn Croquette, Crispy Calamari, and Duck Gyoza. The launch of Wonderland marks the turn of the season for Flair No. 5. Filled with music from the hottest DJs in town, impressive drinks and food lineup, plus the beautiful Dubai crowd, it’s the perfect formula for an epic night every Monday of the week!